We invite you to explore India - the Land with infinite beauty ! Whether you soar high into Himalayas or peer under the ruins of the Ancient monuments dotting the landscape of India, you will cherish the experience long after your visit ! This India Travel Guide on Nalanda University is free from any commercial interest! This site is dedicated to promote India - the vast subcontinent, its glorious past, magnificent landscape and its infinite variety. This ancient seat of learning, Nalanda, was founded in the 5th century AD. About 62 km from Bodhgaya and 90 km from Patna lies the ruins of this world renowned university of yore. Nalanda enjoys the status as the first residential university of the world and is called 'one of the first great universities in recorded history'. Two thousand teachers and a thousand monks' students studied in Nalanda true to the meaning of the word Nalanda -'insatiable in giving'. There are other interpretations for the name Nalanda, given by Hieun Tsang the Chinese pilgrim, is that Shakyamuni Buddha once had his capital and gave 'alms without intermission', and hence the name. In fact students from all over the Buddhist world come here. History has it that Buddha and Mahavira both visited Nalanda several times during their lifetimes. But it was much later in the 5-12th centuries that this university shot to fame. The Chinese pilgrim Hieun Tsang (Xuanzang) stayed here in the 7th century and his excellent notes record the education system and monastic life practiced at the Nalanda premises. The ambience and architectural at this unique university is vividly captured by the Chinese traveler. While the Buddhist monasteries enjoyed the patronage of the Gupta kings, especially under the reign of the Sakraditya, or Kumara Gupta II, it was Emperors Ashoka and Harshavardhana who are celebrated as patrons who built several temples, monasteries and viharas in Nalanda. Some historical studies credit Sakraditya as the founder of the Nalanda University, and there is also a seal discovered at the site pronouncing this. The famous historian Sukumar Dutt describes that the history of Nalanda university 'falls into two main divisions - first, one of growth, development and fruition from the sixth century to the ninth, when it was dominated by the liberal cultural traditions inherited from the Gupta age; the second, one of gradual decline and final dissolution from the ninth century to the thirteen--a period when the tantric developments of Buddhism became most pronounced in eastern India'. The Nalanda complex was built of red bricks and the ruins occupy an area of 14 hectares. Nalanda seems to have attracted students from far and wide, as far as China, Greece and Persia. Marked by lofty wall and one gate, Nalanda is indeed considered an architectural masterpiece. It has eight separate compounds and ten temples, along with other classrooms and hall for meditation. Lakes and parks adorn the grounds around the university. The library was located in a nine storey building - considered an architectural splendor. It had meticulous copies of texts reproduced; Nalanda housed eight separate compounds and ten temples. There were three main buildings in the library - which was as high as nine storey tall - Ratnasagara or the Sea of Jewels, Ratnadadhi or the Ocean of Jewels and Ratnaranjaka or the delight of jewels. There were a number of manuscripts in the Nalanda University which are fine examples of the items that were excavated and displayed at the Nalanda Museum. The Nalanda University Ruins Archeological complex is a beautiful building with gardens. There were monasteries at the end of the Viharas and a temple of Chaiyas on the west. A small chapel still holds a half broken statue of Lord Buddha. Large chunks of Tibetan Buddhism with its Mahayana and Vajrayana traditions were taught by teachers at Nalanda. Several famous scholars including Dharmakirti, taught at Nalanda. Other forms of Buddhism that flourished in Vietnam, China, Korea and Japan were also taught at the university. Several texts associated with Mahayana were seen at Nalanda, which later Hieun Tsang writes in his diaries, was held in contempt by some Sthaviras for its emphasis on the Mahayana philosophy. 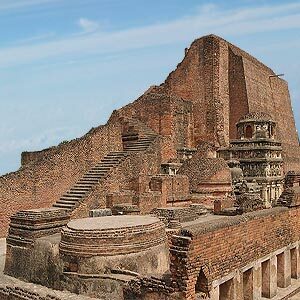 Recent excavations at this site reveal elaborate structures which are displayed at the Nalanda museum in addition to the great ruins. In 1193, Nalanda was ransacked by the Turk Bakhtivar Khilji, who destroyed it. The vast Nalanda library is reported to have burnt for about three months when the invaders set fire to it. As reported by the Persian historian Minhaj-i-Siraj, thousands of monks were burnt alive and thousand beheaded as Khilji tried his best to uproot Buddhism and plant Islam. Some historians cite increasing jealousy by Trithikas against this center of learning lead to them setting fire to enormous manuscripts that belonged to the library. Fortunately, a number of ruin structures survive. The ruins extend a vast area of about 150,000 sq meters and almost 90% of the ruins remain unexcavated. Nalanda is no longer inhabited. The nearest habitation is a village called Bargaon. In 1951, a modern center for Pali studies was founded and Nava Nalanda Mahavihara institute is pursuing an ambitious program of satellite imaging of the entire region. A Memorial Hall for Hieun Tsang, the great Chinese traveler is under construction. The nearest airport is at Patna at 89 km. Trains run to Rajgir which is the nearest railway station to Nalanda. Nalanda is also connected by road to Rajgir and Bodh Gaya which is 110 km away. The Bihar State Tourism Corporation organizes trips to Nalanda.